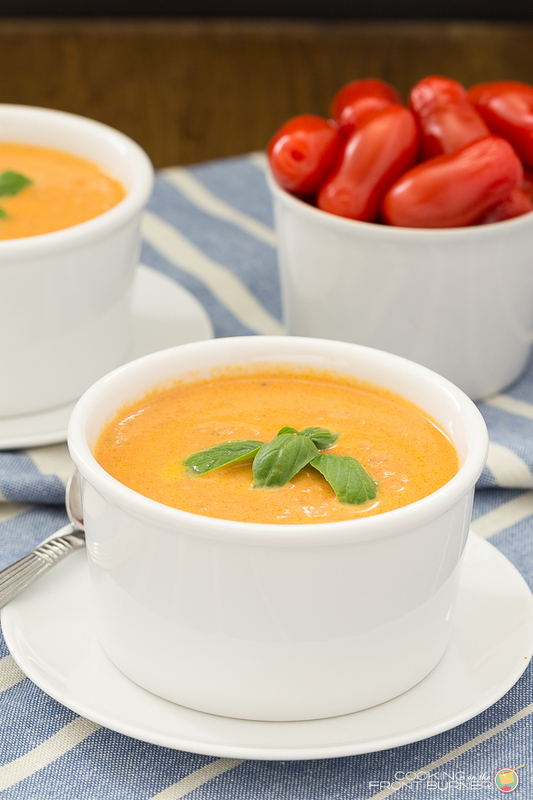 Fresh tomato basil soup is kicked up a notch with feta cheese. 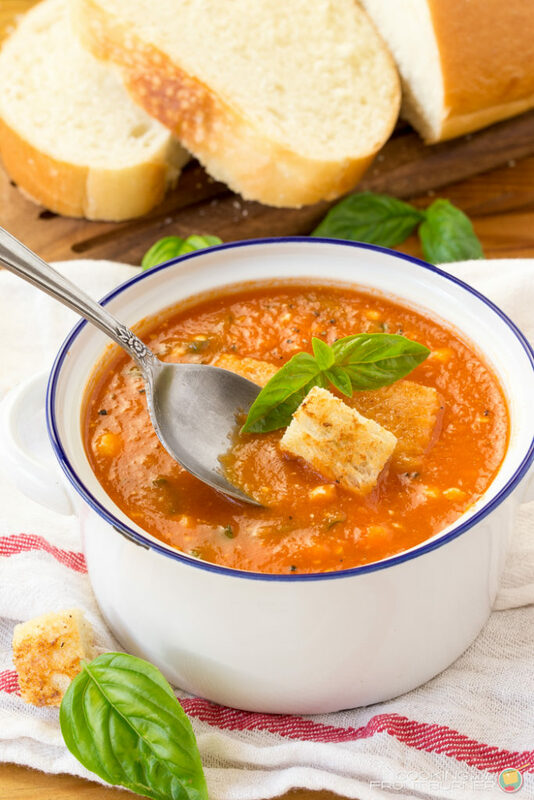 Easy to make, this easy homemade soup recipe makes delicious comfort food!! Today brought a trip to the Farmer’s Market. It was quite cool for a summer day – only 62 degrees and a bit rainy but nothing was going to stop me today from going. I love going to the Farmer’s Market on Saturday mornings but we haven’t been home on Saturdays in over a month! Today was perfect too since I knew I wanted to make a soup and having the weather a bit cooler was a good time to make this Fresh Tomato Basil Soup with Feta. It really hit the spot and the kitchen aromas were wonderful. 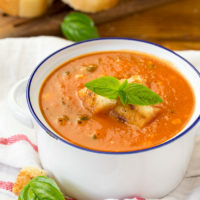 I first had this fresh tomato basil soup when a friend of mine (who just happens to be my previous supervisor) had us to her place for dinner a couple months ago. She retired last year and while we had a “reporting” work relationship, we also were friends. We are close in age, have similar interests and are foodies. Most of our conversations center around recipes – what we may have made over the weekend, suggesting recipes for each other to try and yes, sometimes we even cook together. For a couple years we have auctioned off dinners for United Way for two couples. We always prepared the food at my place and had a great time coming up with menus and serving our co-workers. The DIY Guy and I really enjoyed this tomato basil soup. I love the addition of the feta cheese – it doesn’t melt and just provides a nice texture. Her soup was a bit thicker and I think my tomatoes may have been a little watery. When I make it again, I will either cook it off longer or place my tomatoes in a strainer. The flavor was still wonderful. Not only did I get my tomatoes at the farmer’s market, but I also got the basil and onion. 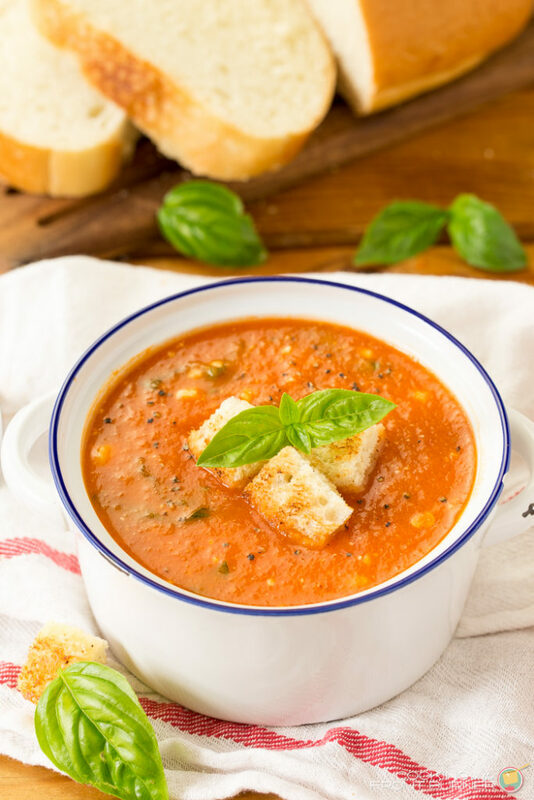 Nothing like fresh ingredients when it comes time to making recipes like this fresh tomato basil soup with feta! I happen to have tomatoes, basil, and onions growing in my garden right now. I would love a bowl of this soup right now! Thanks Amy! You should make a bowl! I am drooling over here! What I would give to have a bowl right now! I wish this was my lunch today! It looks scrumptious! Oh, Deb, this looks so fantastic! 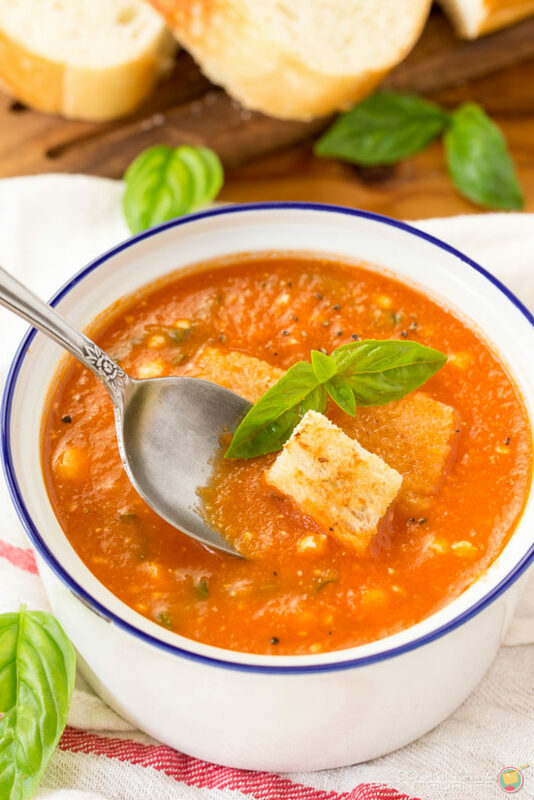 I adore tomato soup, and the addition of feta is a brilliant idea! 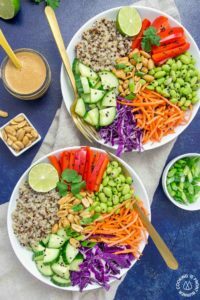 Vibrant and healthy – yet perfect comfort food, as well! Definitely pinning this to save and to share (and maybe drooling just a little as I do it … 🙂 )! I love tomato soup and yours looks so creamy and delicious. I would love a bowl for lunch today. 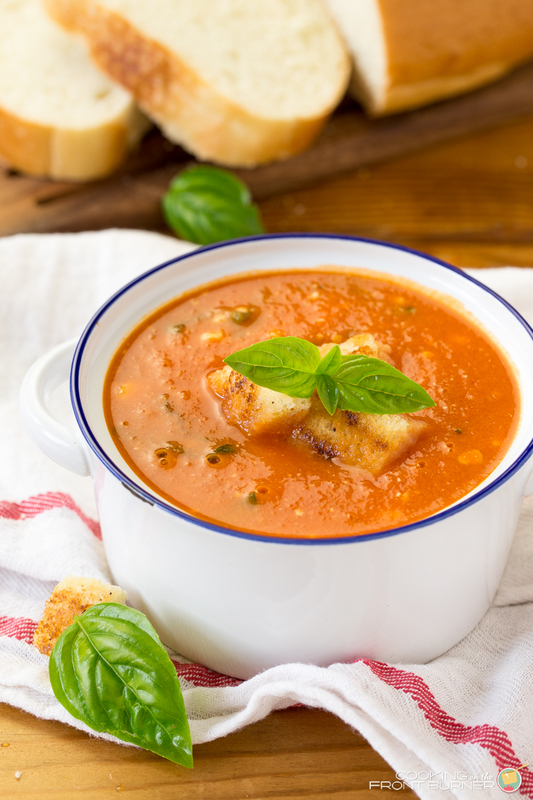 Mmmm–I love homemade soup! This sounds so comforting! This makes me crave Fall weather! This is perfect to warm up with on a cool fall day which will soon be here! 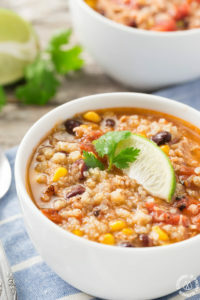 One of my favorite soups! I can't wait for a cooler night to make this! I love tomato soup and the addition of feta puts this right over the edge! YUM!! 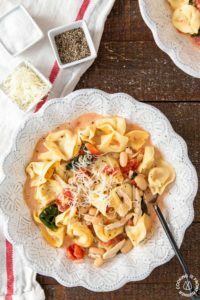 I have extra ripe tomatoes that I could use in this recipe but how do I skin them? I just used a small paring knife but you could boil some water and dip them in for about a minute – that would loosen the skin and you could peel them easier. Your photos are always so pretty Deb, and this soup looks so inviting! I love the addition of the feta too! 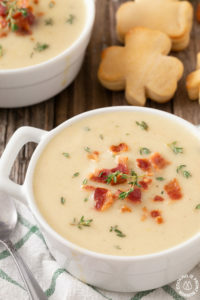 This is one of my all time favorites soups! So delicious! I am so ready for comfort foods like this! The soup looks fantastic! Please make sure to remove the bay leaf before you puree the sauce though. What kind of tomatoes. I’ve used big boys and plum tomatoes which are such different sizes. I used plum tomatoes – I will update the recipe.